House Gets Another Turn At Passing Bailout Bill The Senate passed the Wall Street rescue plan Wednesday by a significant margin. Presidential hopefuls Barack Obama and John McCain were among the 74 senators who approved the bailout. The legislation moves to the House, where party leaders are more confident it will pass this time due to tax breaks added to the $700 billion plan. The Senate passed the Wall Street rescue plan Wednesday by a significant margin. Presidential hopefuls Barack Obama and John McCain were among the 74 senators who approved the bailout. The legislation moves to the House, where party leaders are more confident it will pass this time due to tax breaks added to the $700 billion plan. This is Morning Edition from NPR News. Good morning, I'm Renee Montagne. Steve Inskeep is on assignment. I'm Ari Shapiro. The huge financial rescue package that died in the House on Monday was resurrected by the Senate last night. 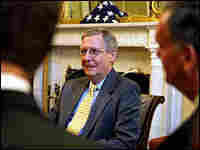 Barack Obama and John McCain were among the 74 senators who approved the bailout. Twenty-five voted against it. Now the bill goes back to the House. This time leaders from both parties are optimistic that it will pass. One reason, $110 billion in tax breaks that were added to the $700 billion package. NPR's David Welna has this report. DAVID WELNA: As they do only on the most solemn of occasions, senators remained at their desks in the Senate chamber as they cast their votes on the bailout bill. The measure continues to draw protests from angry constituents even after the stock market plunged with the bill's defeat in the House and even as the flow of credit keeps getting tighter. Just before the vote, Majority Leader Harry Reid portrayed it as a decision requiring a profile in courage. Senator HARRY REID (Democrat, Nevada; Senate Majority Leader): Some members in both chambers of Congress ask how they can explain a vote in favor of this legislation to the constituents. Here's how. Not with any sense of glee or satisfaction, but with a sense of confidence that when called upon to choose between what is easy and what is right, we rejected the easy and chose the right. WELNA: It was what lawmakers call a legacy vote, one they'll likely be reminded of for better or worse for years to come. 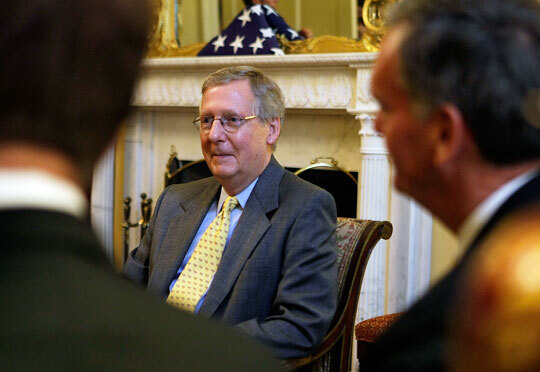 Minority Leader Mitch McConnell noted that it came at an especially difficult time. Senator MITCH MCCONNELL (Republican, Kentucky; Senate Minority Leader): We clearly have demonstrated in the toughest possible situation, five weeks from an election, that we can come together and address a major crisis. WELNA: It clearly helped that only 30 of the 99 members voting last night are up for re-election next month, compared to the entire House of Representatives. Support for the measure was close to even between the parties. Thirty-nine Democrats, 34 Republicans, and one independent voted for it. Nine Democrats, 15 Republicans, and one independent opposed it. Among those arguing for the financial rescue was the Republican who negotiated its terms, New Hampshire's Judd Gregg. Senator JUDD GREGG (Republican, New Hampshire): And the hand we've been dealt is a pretty bad hand. And the options are really few. And our situation as a Congress is this. If we fail to act we will fail the nation. We will fail our constituents. We will fail the people on Main Street. And we will fail future generations. WELNA: And while both Barack Obama and John McCain left the campaign trail to vote in favor of the bill, only Obama spoke on the Senate floor. Senator BARACK OBAMA (Democrat, Illinois; Democratic Presidential Nominee): We can't afford to take a risk that the economy of the United States of America, and as a consequence the worldwide economy, could be plunged into a very, very deep hole. WELNA: But Alabama's Richard Shelby, the top Republican on the Banking Committee voted against the bill. He took a dim view of the bipartisan calls for immediate action. Senator RICHARD SHELBY (Republican, Alabama): Many around here are finding comfort in the notion that something is better than nothing. I believe that is a false choice. The choice we faced was between pursuing an informed response or panic, and I think we chose panic. WELNA: After the vote, President Bush issued a statement urging the House to act swiftly as well. House Majority Leader Steny Hoyer said he intended to bring the bill up for a vote on Friday, even though he and other Democrats don't like the fact that some of the tax breaks added to it are not paid for. Representative STENY HOYER (Democrat, Maryland; House Majority Leader): We don't have time. The economy will not wait. The markets are skittish and fragile. And so, on a bipartisan fashion I may be upset, some others may be upset, but we need to get this done if we can get an agreement of the majority of the House of Representatives. Then we need to move it. WELNA: Many House Democrats remain opposed to the bailout, and Hoyer said he'll need 100 House Republicans to vote for the bailout for it to pass. On Monday, only 65 of them voted that way. House Republican Leader John Boehner told FOX News he thinks there will be more yes votes from his caucus on Friday. Representative JOHN BOEHNER (Republican, Ohio; House Minority Leader): I think the package they're putting together has a much better chance than what we had on Monday. WELNA: Boehner said both the stock market plunge and the added tax breaks have many GOP House members rethinking their opposition. David Welna, NPR News, the Capitol. A day before the vote, lawmakers huddled in the office of Senate Minority Leader Mitch McConnell (center). The Senate approved a $700 billion rescue package for the financial industry Wednesday night, giving new life to the bailout by loading it with tax breaks and other provisions tailored to help ease its passage in the House, where an earlier version fell a dozen votes short Monday. The 74-25 Senate vote — well over the 60 votes needed for passage — comes as the House gears up to consider the massive plan on Friday. President Bush issued a statement lauding the action in the Senate. "With the improvements the Senate has made, I believe members of both parties in the House can support this legislation," Bush said. "The American people expect — and our economy demands — that the House pass this good bill this week and send it to my desk." Even though it looks more likely that a rescue package for the financial industry will be sent to the president this week, investors are still wary. They are concerned that the $700 billion plan won't be enough to stave off more bank failures or end up doing enough to ease the current credit squeeze. The Dow Jones industrial index ended down almost 20 points, at 10,831.07. Investors are now looking beyond the bailout package to how this crisis is likely to affect the economy. They are bracing for nothing less than a recession. Since the House rejected the rescue plan Monday, sending financial markets plummeting, the tenor of the conversation has clearly changed. "Last week it was overwhelmingly, 'Vote no'; the tone has changed," Sen. Charles Schumer (D-NY) told CNBC on Wednesday morning. "You never can predict on something like this until you have the votes, but on the Senate side there seems like there is broad, bipartisan support. If I had to guess I would say that it would pass both bodies." Lawmakers and the White House are focusing on the economy and what small-business people and ordinary Americans have at stake. Senate Majority Leader Harry Reid (D-NV) provided a roster of examples for reporters in which he said the financial crisis was starting to bite ordinary Americans. He said one auto dealer in his district — who has been in business for more than 50 years — called him to say he couldn't get credit. Reid said people waiting to take out mortgages were losing escrow money. The narratives were clearly aimed at getting any fence-sitters in the Senate or the House to back the bailout proposal. The Senate measure is very different from the one Treasury Secretary Henry Paulson presented to Congress last week. Lawmakers in the House added provisions that would dole out the $700 billion the government wants to buy bad loans in three tranches. It also gives taxpayers some assurance that they would be paid back if and when the financial institutions they rescue get back on their feet later. The bill also includes beefed-up oversight of the program and a cap on compensation for executives who have the Treasury buy up their bad mortgages. The Senate, for its part, added "sweeteners" that would increase bank deposit insurance and extend tax breaks. Republicans have agitated for both provisions. As it stands now, the bill would temporarily raise the limit on federal deposit insurance to $250,000 from $100,000 per account and provide more than $100 billion in tax breaks, including extending alternative minimum tax relief for middle-class taxpayers and property tax relief. The FDIC insurance measure is meant to help restore confidence in the nation's lenders. Federal Deposit Insurance Corp. Chairman Sheila Bair sought the increase Tuesday. The Senate's tax breaks would include some $78 billion in renewable energy incentives and extensions of expiring tax breaks. Those breaks would cost about $112 billion over the next five years. Overseas, similar guarantees have been already been promised. Prime Minister Gordon Brown said Tuesday that the British government plans to raise the guarantee for bank savings to 50,000 pounds (about $90,000) from 35,000 pounds in a new banking law. Earlier that day, the Irish government guaranteed unlimited bank deposits in Irish banks for a period of two years. Both Republican presidential nominee John McCain and Democratic nominee Barack Obama had expressed support for the Senate proposal. Both senators returned to Washington to vote on the measure Wednesday evening. Earlier, McCain told NPR's Steve Inskeep that he was "guardedly optimistic" the bill would pass. "I think we've made improvements to the bill in a variety of ways, including the amount of money we pledge upfront, to better oversight, to allowing more options for insurance," McCain said. "I think the original version has been improved. But now, we can't let the perfect be the enemy of the good." Bush had been contacting senators to lean on them to pass the bill. White House spokesman Tony Fratto said in an e-mail that the president is increasingly concerned about a seizing up in the credit markets. "This morning we're seeing increased evidence of the credit squeeze on small businesses and municipalities all across the country," Fratto said. "So it's critically important that we approve legislation this week and limit further damage to our economy." The London Interbank Offered Rate, or LIBOR, the rate at which banks lend money to each other, climbed to an all-time high of 5.07 percent overnight. That's a pretty good barometer of how much banks trust — or don't trust — each other. Banks that have cash are hanging on to it and clearly are loath to lend to others for fear they might not get their money back. Their wariness is not misplaced. European and U.S. governments have had to rescue five banks in the past week alone. The big problem for banks is that they "don't know who will be in business next week," said Michele Gambera, chief economist at Ibbotson Associates. 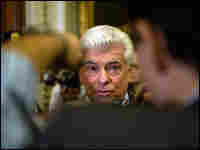 Although senators approved the bailout plan, lawmakers aren't out of the woods yet. Conservative Republican members of the House are still calling for some sort of mandatory insurance program that financial firms would be required to buy, but it is unclear how the program would work. They have also asked for the Securities and Exchange Commission to suspend mark-to-market accounting rules and instead require bank regulators to assess the real value of troubled assets. Mark-to-market accounting essentially allows Wall Street firms to value (or "mark") the assets in their portfolio based on current market prices. The problem, critics say, is that under that accounting rule, sliding home prices affect not just the value of mortgages that are defaulting but of all mortgages — and therefore, of all mortgage-backed securities. That, in turn, affects how much capital firms are required to have on hand to cover their debt exposure. And to raise that capital, firms end up having to sell other assets — which drives the price of those assets down, too. In other words, they say, mark-to-market accounting can lead to a downward spiral. House Democrats have been opposed to both a change in mark-to-market accounting rules and to the insurance provision. It is unclear how they will work out those differences or how much the House will tinker with the bill when they get it. That said, the sense on the Hill is that everyone wants to get the vote behind them, key lawmakers say. The Council of Institutional Investors and the CFA Institute oppose a suspension of mark-to-market — also known as "fair value" — accounting because, in their opinion, the rule offers investors transparency. "In the interest of investor confidence and the health of our capital markets and overall economy, we urge the SEC to resist calls from those with a questionable commitment to transparency and to reject any proposal that would suspend fair value accounting.